We came across this wonderful free directory of Worldwide Permaculture Design Courses and all types of sustainable living courses, workshops and events from across the globe. This is a free directory allows you to add your course, event, or workshop to the list so folks can find your information. This directory strives to reconnect people with nature - remembering our collective heritage, creating a beautiful thriving future, rooted in community and sustainability. You can join them in creating an incredible world where everyone can truly thrive. Directory submissions from around the world include locations in North America, Australia, Europe, South America, Africa, and Asia. You can discover Permaculture, Organic Gardening, Natural Building, Sustainable Living courses, events, workshops and festivals, as well as add your own. The directory also offers the Permaculture Media Blog, which presents free educational resources for sustainable living. The best free sustainable living and educational media on the web with over 1700 videos, eBooks, podcasts and documentaries. You can access free open source documentary films, ebooks, videos, articles and news about permaculture, peak oil, natural building, alternative energy, ecology and environmental activism. Permaculture is an integrated set of principles and methods for designing, setting up and running sustainable human systems. But that rather technical definition doesn’t quite describe the soul of permaculture, which could be said to be the art of respecting nature and working with it, rather than against it, to cultivate land, plants, animals and people by fostering mutually beneficial relationships between them. In this sense it’s also the art of achieving the most by doing the least, and you can see this at permaculture farms, where weeds might be allowed to flourish because they’re healing the soil, or where chickens scratch around in the vegetable garden, eating bugs and fertilizing the soil. Permaculture is about harmony between people and nature. There’s no rocket science to it; it’s grounded in in-depth observation of the natural systems already present on the land. Only when you know how the wind and the sun flow over the land, how the animals move, how the soil is composed and what plants naturally flourish there, can you begin to design a system that truly fits there. On top of observation, permaculture designers use knowledge of traditional farming methods, knowledge of local flora and fauna, and knowledge of cutting-edge ‘appropriate technology’, to create human settlements that sit lightly on the earth. Permaculture is anything but airy-fairy. It’s about trying things out and experimenting. It’s about doing what you can do now and seeing what changes result. For example, saving energy by ride sharing or taking the bus, or joining a CSA to support local organic farmers, or taking a composting class (many cities offer these for free) and recycling your yard waste into rich soil for your garden. The way we live now in the US is unsustainable, but we can take many small steps to make a difference, and we can get together in communities and help each other to make wider changes. Permaculture encourages us to see solutions, rather than problems – and as such it can be solace to the soul of exhausted activists. The ethics of permaculture are centred on care: for the earth and for all the living beings upon it, including people. This is a deep ecological viewpoint in which every living being has intrinsic value, because every living being is contributing to the earth’s ecosystem in its own unique way.For a permaculturist, cooperation with other beings, rather than competition, is the key to success. Success is measured in diversity of life, and the wellbeing of all. A curious thing happens when you study permaculture: you begin to have a sense of optimism about how we really can save the earth. Permaculture experts are involved in projects worldwide that involve such vital issues as rainwater capture, desert regreening and soil regeneration. Projects that really work, demonstrating that we can reverse the damage that has been done, restore the health of the earth, and establish sustainable systems that will ensure us a better future. 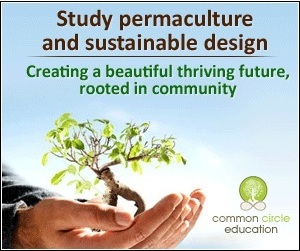 Permaculture has become a world-wide movement and was developed by Bill Mollison and David Holmgren, in Australia. A wonderfully,well written explanation of permaculture!!! I have heard the word used, but had no idea exactly what it meant. How refreshing to find something that so closely matches my own personal beliefs about life and living on this unbelievable planet. I am truly excited to start exploring! Thank you so much! Anonymous - We're happy you enjoyed the post. Check back often as we're sure to have more information and resources that you will also enjoy. Sticker Printing - We look forward to posting more items that you will enjoy with information and resources that you can use. Thanks for stopping by. Permaculture in the design is actually a copy of human settlements and perennial relationship found in the natural ecology of agricultural systems.